I love photographing destination weddings because you never know what you might encounter. 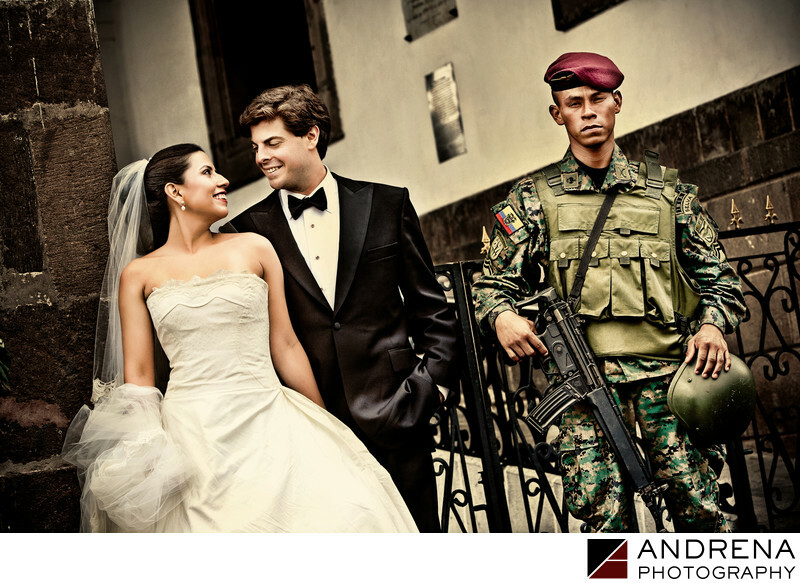 This destination wedding photograph was taken just after the military coup in Quito, Ecuador. Varying stories about what actually happened were told in the media, and the actual story seemed a bit murky to those of us reading conflicting media accounts. Regardless of what actually happened, when we arrived, the city was being controlled and patrolled by the military. This image was taken during our day-after session. I love doing day-after sessions at destination weddings because they really enable me to capture the charm of the local surroundings. My second photographer and I noticed the soldiers at the exact same moment, and we asked the bride to ask (in her native Spanish) whether or not we could take a photo. The soldier nodded yes, and I was able to grab this wonderful photograph. The solider's stern face and focused expression provide the perfect contradiction to my happy bride and groom. After 30 seconds or so, the soldier gave us a signal that we had taken enough photographs, so we thanked him profusely and walked away. This image -- which I call "Love in a State of Emergency" -- was profiled in Rangefinder Magazine's RF Cookbook, and has been displayed at a Russian photography conference. Destination wedding photographed in Quito, Ecuador.